IT'S show day in the Derwent Valley today: Bushy Park Show Day. 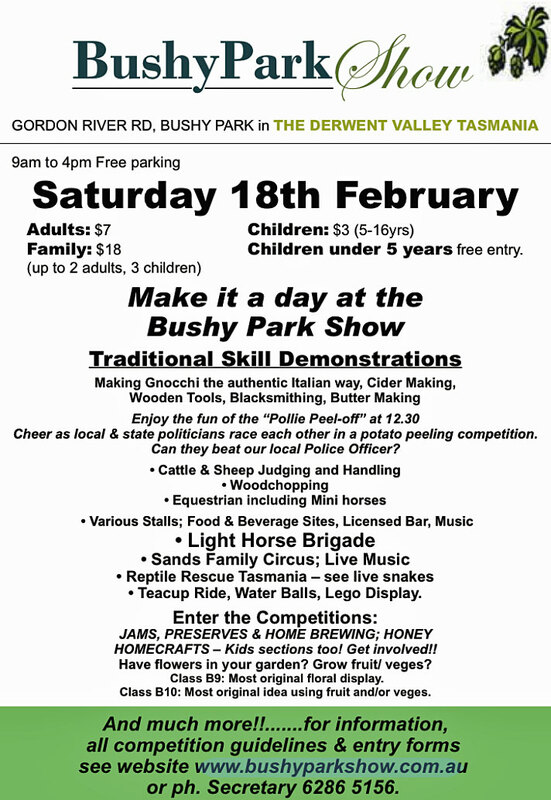 There will be plenty to see and do at the Bushy Park Showground and visitors will also be welcomed at the town's community market, swimming pool and local businesses. 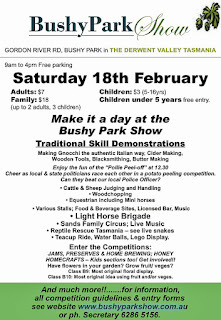 THE SHOW: Lots of family fun at the Bushy Park Showground, Gordon River Rd, from 9am until 4pm. Entry will cost $7 for adults and $3 for children aged 5-16. Accompanied children aged under five are admitted free and family entry costs $18 (up to two adults and three children). More information on the official website and Facebook page. BUSHY PARK MARKET: Open from 9am-4pm today and tomorrow at the Upper Derwent United Hall, Gordon River Rd, Bushy Park, with a large range of collectables including bent blackwood ski blanks, rare spanners, a sail-makers axe and much more. Today only, there will also be a Show Day sausage sizzle. BUSHY PARK POOL: Open today and tomorrow from 10am-6pm. Solar-heated pool, kiosk and free barbecue facility at the Bushy Park War Memorial Swimming Pool, Gordon River Rd, Glenora. Admission $3 for adults and $1.50 for children. More information on Facebook.